Winter is HERE, even though it officially doesn’t start for a couple more days and that means icy roads and sidewalks. Practice good Spine Health by walking like a penguin this winter season. Usually, when we walk our legs ability to support our weight is split mid-stride. Which is ABSOLUTELY FINE on a normal “non-icy” or “slippery” surface. 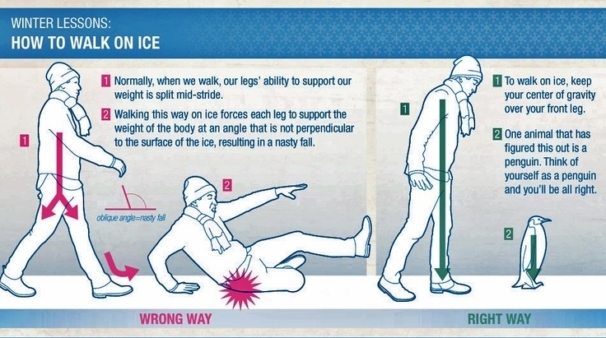 However, when we are walking this way on ice it forces each leg to support the weight of the body at an angle that is not perpendicular to the surface of the ice…. this can often result in a NASTY fall…. which can compress our spine – bruise our tailbone – strain our back muscles – and may even result in broken bones. To walk on ice the best way to avoid strain to the spine is to keep your center of gravity over your front leg and TAKE SMALL STEPS! One animal that has figured this out is the penguin. THINK OF YOURSELF AS A PENGUIN AND YOU WILL BE ALL RIGHT!